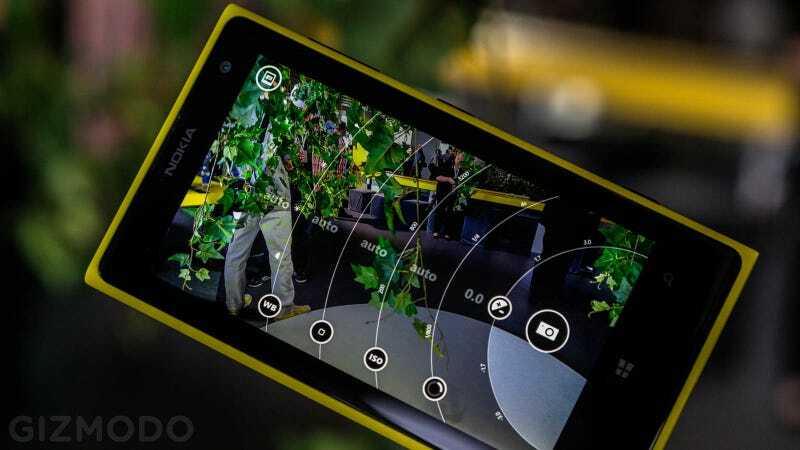 The first question you'll have about Nokia's new Lumia 1020 is how the photos look. And yes, they're so very sharp. But what may have been overlooked is that the rest of the phone, which is still, you know, a phone, is (almost surprisingly) on point too. Before you even get to the camera, you notice how light the 1020 is. Much lighter than it looks! The 1020 (ugh, these names. WHY NOT 1000, LIKE A TERMINATOR?) is thinnish, but not too thin, making the relative weight surprising. The polycarbonate shell (matte finish) feels strong, though. It's just without heft. The phone is 158g, which is less than the not-too-hefty-at-all Lumia 928, and just a hair over the 143g HTC One and the 130g Galaxy S4. The iPhone 5 is 112g, but it's also tinier, so no biggie, really. Definitely a good thing, considering the PureView 808 was sort of like an anvil. It's not just light, it's decidedly not unbearably ugly. That is a big deal, actually, because there was a chance it would be so impossibly misshapen that all the Finnish designers in the land couldn't hide it. It's not the most beautiful phone, but it's just not-ugly enough to own. Then there's holding the thing, which is another sort-of surprise. The bulge on the back of the phone isn't as bad as it looks in some photos, but it's defintiely going to take some getting used to. It just doesn't sit flat in your hand, and if you've used a smartphone in the past seven years, that's going to be an adjustment. It's not too steep a gradient, though, and if you don't have massive hands, you might actually get some ergonomic value out of the gentle slope as a place to rest your fingers. And then the camera. It's great, as you'd expect. Pushing in on areas of the screen for zoom is impressive, and the images are incredibly sharp for a phone. I'd believe that they were taken with a pretty good point and shoot if no one told me otherwise. And the screen's color performance makes the images look great (maybe a little oversaturated, but that's sort of the norm for good cameraphones now). You can also calibrate the screen once the Windows Phone Amber update hits, but that's a ways out. We weren't able to send out any photos to ourselves (because of beta firmware). The manual focus does not work in the middle of shooting video (a long-running unicorn for video nerds), but the relative access to the controls is still pretty great. Zoom in video mode, stabilized only by the OIS, actually looks shockingly steady. Zoomed all the way in and walking around, the video looked perfectly acceptable, which is impressive. Speaking of which: The Nokia Pro Camera might actually be just as much of a big deal as the camera itself. The dial controls are magnificent, and actually great UX. You just drag the shutter button to the left (you can thumb it) and it gives you all of the controls as dials. Exposure, focus, ISO, white balance, all of them. And then if you want to default back to auto, you just slide the shutter button to the left again. Otherwise, tap outside the wheels or press the shutter and shoot away. You can also pop out individual settings by tapping on them at the top of the screen. It's very, very fluid in practical use, and honest to god, it's better than the crud companies like Nikon and Canon use on their touchscreens. Hey guys, this is how you do this. The camera grip case is going to be expensive ($80, sigh), but it feels pretty great at first glance. It's got a 3000mAh battery in it, which is good enough to start, and it's a made of the same polycarbonate as the phones. It's quite solid—solid like a Mophie, which is really solid—and the shutter button works really fluidly. Moreover, the extra grip makes using the Pro Camera dial controls easier, since you don't always feel like you're going to be bumping into the screen accidentally. The downside is that if you have smaller hands, it makes thumbing the dials on the far left tougher. It's thin enough, though, that we'd be a little cautious about it breaking if just tossed into a bag like a rag doll. We aren't able to share sample shots with you, because we were playing with a prototype. All around, though, this thing is really great, and as long as it's durable (big thing to wait for a review for! ), and you can live with Windows Phone 8, it'll be a wonderful thing to carry around at all times in your bag.